This year's report from the U.N.'s Office on Drugs and Crime did something that last year's did not: it addressed the "growing chorus" of people in favor of abolishing drug laws altogether. And though its authors maintain that legalizing narcotics would be an "epic mistake," the office's executive director, Antonio Maria Costa, does agree that loosening regulations might not be such a bad idea: "You can't have effective control under prohibition, as we should have learned from our failed experiment with alcohol in the U.S. between 1920 and 1933." 1. On cocaine and heroin trafficking: "The $50 billion global cocaine market is undergoing seismic shifts. Purity levels and seizures are down, prices are up, and consumption patterns are in flux. This may explain the gruesome upsurge of violence in countries like Mexico ... While 41 % of the world's cocaine is being seized (mostly in Colombia), only one-fifth (19%) of all opiates are being intercepted ... 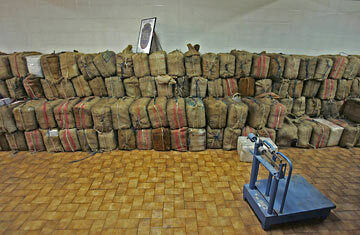 In 2007, Iran seized 84% of the world's opium and 28% of all heroin." 2. On moving beyond "reactive law enforcement": "Those who take the "drug war" metaphor literally may feel this effort is best advanced by people in uniform with guns [but] in the end, the criminal-justice system is a very blunt instrument for dealing with drug markets ... the arrest, prosecution, and incarceration of individuals is an extremely slow, expensive and labor-intensive process." 3. On targeting the right people in cracking down on drug dealing: "Street drug markets do not exist in a vacuum. The drama is played out on a very particular kind of stage, and it is the stage manager, not the actors, that must be addressed. The property in these areas is owned by someone, someone whose neglect of their property allows illicit activity to continue. Unlike the street addicts and gang members, this someone has something of value to lose  their property." See a graphic on addiction and the brain. 4. On scrapping the one-size-fits-all approach: "There is a common tendency to treat the galaxy of illicit substances as an undifferentiated mass. Different drugs come from different places, attract different consumers, and are associated with different problems ... For example, cannabis is grown in at least 176 countries around the world. It can be grown indoors or outdoors, and is often cultivated in small plots by users themselves ... For most synthetic drugs, the skills needed to access and process the needed chemicals are not widely spread and, consequently, the market tends to favor more organized groups ... In contrast, most of the cultivation of drug crops like coca and opium poppy is confined to small areas within two or three countries. Most of the world's heroin supply is produced on a land area about the size of Greater London." "It all started in Shanghai in 1909," the authors note of the dawn of narcotics regulation. And what a century it's been. What began as an opium epidemic in China has since become a global problem that includes heroin, cocaine, marijuana, amphetamines and a host of other illicit substances that compose a $320 billionayear industry, making drugs one of the most valuable commodities in the world. But despite arguments that legalizing drugs would destroy the organized-crime rings that currently control the market, the report argues that "mafia coffers are equally nourished by the trafficking of arms, people and their organs, by counterfeiting and smuggling, racketeering and loan-sharking, kidnapping and piracy, and by violence against the environment." As Costa said in a statement announcing the report's release, "It is no longer sufficient to say: no to drugs. We have to state an equally vehement: no to crime." See pictures of Liberia's cocaine country.